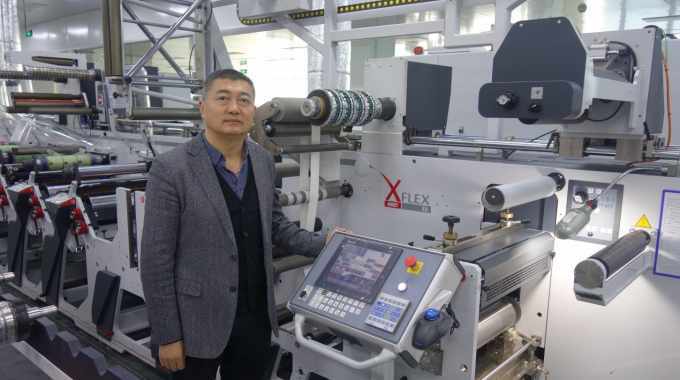 China’s Beijing Deji Informational Technology has installed a second Omet XFlex X6 as it looks to build its business through investment in next-generation printing technology. One of China’s leading privately-owned label converters, Beijing Deji has added an almost identical press at its facility in the Tong Zhou District, near to China’s capital city. Both presses are 10-color machines with full UV curing and a 430mm web width. Other capabilities include screen, hot and cold foil, delam/relam, web turn bars and twin die-cutting stations. Established initially in 2004 in the Chang Ping zone on the northern side of Beijing, the company’s early purchases were Labelmen rotary letterpress lines for the production of automatic labeling labels. As demand grew and diversified into new markets, the converter’s owner, Mr Yu DaYang, decided he needed to research what the new flexo presses had to offer and undertook extensive print trials of his work on the leading manufacturers’ machines. Since being fully commissioned, the Omet XFlex X6 presses have continued to add at least 20 percent to the company’s productivity year-on-year, according Mr Yu. Much of Beijing Deji’s work is for the white wine trade and in the dairy industry, especially milk labels, and the two Omet lines are kept busy working 20-hour days, Monday to Saturday. It was this rapid growth in business that highlighted the need for a second press, and after visiting Italy for more trials, the order was agreed and signed at Labelexpo Europe 2017 in Brussels, with the press being installed in August 2018. He was also influenced by the fact that Omet has a good reputation in China, with more than 70 users, and the Italian manufacturer has a well-established sales and service facility in Suzhou. As a private company, Beijing Deji is able to steer its own course for development, and Mr Yu has ambitious plans for growth. In 2018 the company will generate sales of ¥50 million CNY ($7.4 million USD), but with the new Omet XFlex X6 press now fully operational, he is aiming at ¥80 million for 2019. He is fully confident of achieving it with the added-value capabilities of his Omet lines. These are to be added to with Xflex X4. Mr Yu adds that China takes its environmental responsibilities very seriously, especially in the narrow web print sector, and he knows that only ongoing investment in the latest technology will be good enough to meet the stricter targets. This is part of his rationale for targeting the top end of the label market, where the margins are better, and provide the funds for air purification systems and exhaust emission control. Further, Beijing Deji is currently attracting a lot of business through online tendering, which unlike an auction with many bidders, is limited to targets with high quality requirements rather than price only. Another consideration is China’s burgeoning growth in population and income, which brings increased brand awareness on packaging diversification as well as more precise service that places huge pressure on the packaging sector of the printing industry. ‘”Quality in-quality out”, makes for a healthy and successful business, and those who deal only in price cutting cannot make the money needed for the latest technology,’ concludes Mr Yu. Yolanda Wang is China editor at Labels & Labeling. With a master’s degree in printing, Yolanda previously worked in the pre-print department at ZRP Group, a leading Chinese printer. She also has two years of editorial experience for ZRP Group’s internal magazine.